Looking up is always rewarding. In Cambridge, even the best known parts - especially the best known parts - have details that easily escape the eye. I like roofs, chimneys, gargoyles, statues, and all the crinkly bits of architecture that show it's all for a purpose, all thought through. Sometimes you can see or guess that what was on paper has some points of difference with what is in stone. Perhaps the architect has seen potential as the building was raised, or more mundanely maybe funds didn't stretch to the original design. 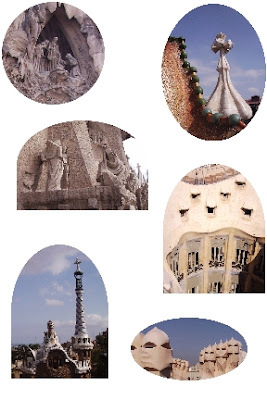 We were in Barcelona not so long ago, and like every visitor must, we marvelled at the Gaudi buildings. Because of Gaudi (and, in a different way, Rogers), we realise that that 'should' relates to our own limited experience and understanding. There's no 'should' about it: it's a matter of skill, and taste, and art, and choice. So common sense turns out to be the box in which we sit - a perfect cube whose walls seem solid but are, in fact, illusions. Look up, and you get a peep outside; maybe you even get a tiny glimpse of the whole scene. There's probably a sermon in that. Must file it away for a few months!